You are all welcome to the March Over The Edge Writers’ Gathering, showcasing poems from contributors to Skylight 47, Issue 1. SPECIAL GUESTS TONY CURTIS & (at the invitation of the editors of Skylight 47) KEVIN HIGGINS. 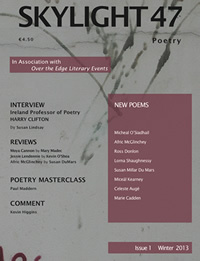 The event will take place at The Kitchen @ The Museum, Spanish Arch, Galway on Friday, March 15th, 8pm. All are welcome. There is no cover charge. Skylight 47 is generously sponsored by Food 4 Thought & Charlie Byrne’s Bookshop.